Friends list and black list NOTES gone! Friends' list and blacklist NOTES are still defective! When is WG finally going to fix that? All my notes are gone, and these notes are crucial to my enjoyment of the game. When I add somebody to my blacklist I also always add a Note detailing why. These notes are extremely helpful in dictating strategy or deciding how to handle certain situations. The same goes for Notes added to players on my Friends list. WG, Please restore this functionality ASAP! For now, I continue to get a red 'internal server error' message when I try to add a note. That sounds like a mod. Vanilla game doesn't have notes BUT SHOULD!! Edited by MacDaddyMatty, Feb 21 2018 - 17:35.
in the past I have had success relogging in, or reloading the entire game as a method to get the friends list/black list back. Of course, in your case, it may be mods that are interfering with those lists. This on both counts. Unless your "notes" just means a list it's likely mods. Also the last time it was broken just logging onto the LatAm server was fixing it (and chat) for lots of folks myself included. Not a WG thing? ?lol.What rock you been hiding under?List goes out regularly and no mods here.This has been going on for months.Has been an issue for some but not all as per WG mechanics.Hey..brown nosing wont get you any where..lol. Friends' list and blacklist NOTES are still defective. So.... Not a WG thing. Seems I don't live under a rock, but on top like a boss. Edited by MacDaddyMatty, Feb 21 2018 - 19:06. Try reading a bit more carefully, it may be hard to see from up on that high horse. So, it is very much a mod issue, and has nothing to do with "brown-nosing"... understand yet? Of course this also gives me an error when I try to do it. But it's weird because I haven't installed any mods since un-installing WOT, deleting it's directory, and re-installing. What mod is it that I have installed? Did you previously have a mod-pack? NOTES has Always been a standard part of WoT (Not a mod) at least for 3 years. And now it is broken. It is an essential feature, especially for the blacklist. NOTES in Friends list and blacklist is STILL broken! Tested both in vanilla client and with mods installed. WHEN WILL YOU FIX THIS IMPORTANT FEATURE, WG??? The NOTES feature on Friends list and blacklist works, but ever since the Halloween update Wargaming flushed all of my notes and has not restored them since. Years of carefully created notes gone! WG: Please restore immediately! Game Discussion → General Discussion → Feedback / Suggestions → We can attach text notes to contacts and blacklists. 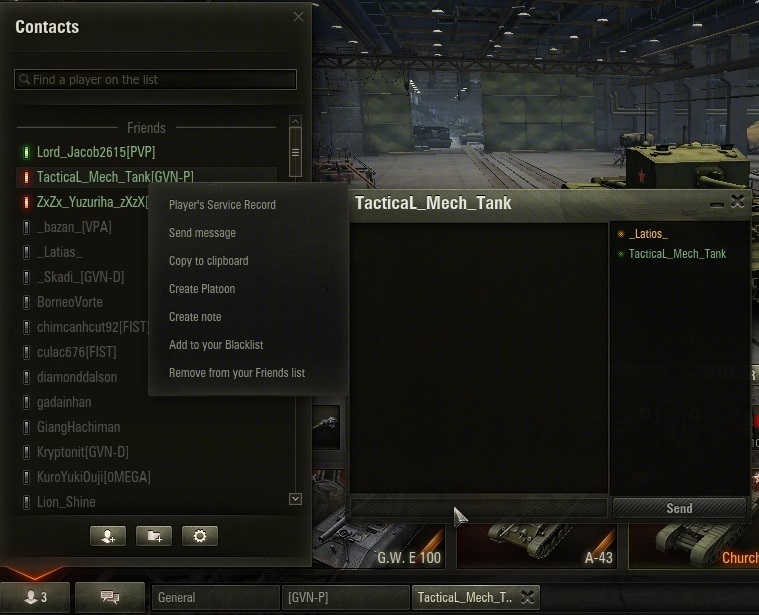 Can we have notes for tanks in your garage?